People suffering from osteoarthritis, the most common form of arthritis, may find that eating more foods that reduce inflammation can help limit their symptoms, according to the University of Maryland Medical Center. A Mediterranean-style diet tends to be less inflammatory than the typical American diet, according to an article published in "Nutrition in Clinical Practice" in December 2010. 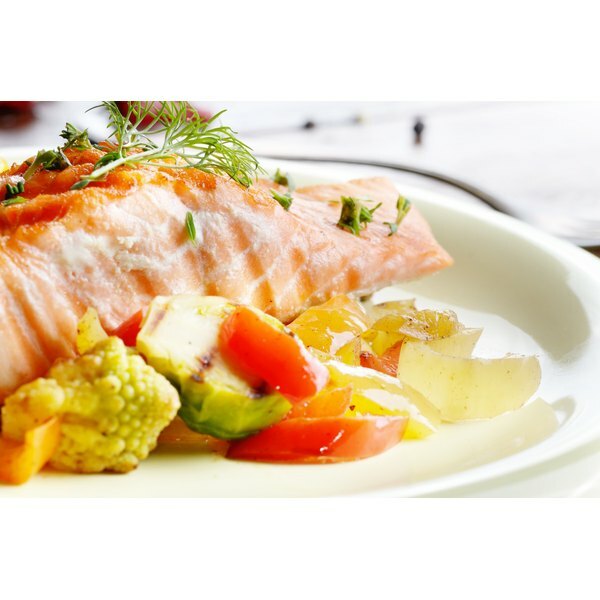 Omega-3 fats, especially eicosapentaenoic acid, may potentially help reduce inflammation and osteoarthritis pain, according to a study published in "Prostaglandins, Leukotrienes and Essential Fatty Acids" in 2010. Get these by eating fatty fish and seafood, such as salmon, more often. Walnut and flaxseeds contain omega-3 fats as well, but in the form of alpha-linolenic acid, which isn't quite as effective. Other beneficial foods for reducing inflammation include fruits, vegetables, legumes, whole grains, soy, Asian mushrooms and tea. In addition, flavor your foods with lemon, horseradish, mustard, onions, curry powder, dill, oregano, cinnamon, chili peppers, garlic, turmeric and ginger. And choose monounsaturated fats, such as those found in nuts, avocado and olive oil, instead of saturated fat. Limit processed foods and refined grains.